FCC filings can be pretty opaque documents, especially when many of the fields can be made confidential until the certified product is released, but a Google filing at the FCC today (rare in and of itself) may be for the next version of Glass. It doesn't tell us much about the product (really, anything), but it does seem to be a filing for a Glass-like accessory based on a few tidbits in the attached documentation. First, the filing is for a "smart" Bluetooth Low Energy device. 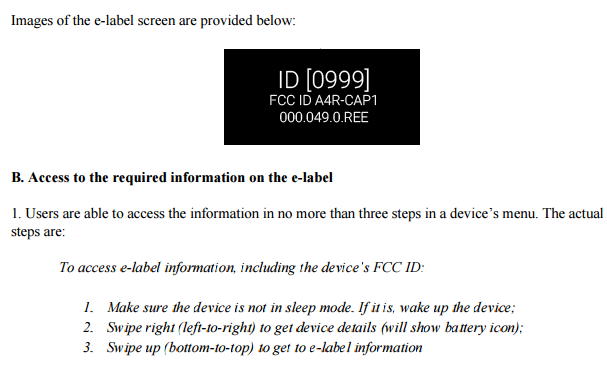 Second, the filing contains an image in the attached label diagram showing an on-screen mockup of what the digital FCC ID (versus a physically imprinted FCC ID label) would look like to a user on the device. And it looks a lot like a Glass card. The instructions for accessing this information are telling. The FCC's new e-labeling rules for FCC IDs require that the ID be accessible within three steps for the end user. The document says a left-to-right swipe (touch sensitive!) will get you to the device details area, and a swipe up will get you to the label. This kind of navigation should be familiar to Glass users, though this isn't how you'd get the hardware ID information for the current version of Glass (which requires more steps). You also have some other takeaways from these steps - the device has a "sleep mode" - suggesting it in some respect is power-limited (thus portable), as further suggested by the battery indicator mentioned in step two. It also has a screen (or can otherwise display visible information, a la Glass). The real sticking point, though, is that this image looks distinctly like a Glass card because of its landscape orientation and multi-line view, suggesting a small visible area (a phone or tablet would probably spell the entire line out). The filing also mentions in testing documents that the "firmware installed in the EUT was... ver 51." Which sounds like a lightly obfuscated reference to Android 5.1, the most recent version of Google's mobile OS. As such, our current best bet is that this is a new version of Glass - but we don't know. It could be something quite different. While a phone or tablet are probably off the table, a smartwatch is potentially possible (though that would be quite a weird change in Wear's navigation scheme), but I'm not liking that option, either. A small fitness tracker with a basic display has been suggested, and while I wouldn't call that unreasonable to guess, it seems strange Google would develop a standalone fitness wearable when Wear devices are supposed to be fitness trackers. More likely possibilities (apart from Glass, which seems most likely), I think, are new Nest products, but what those could be, I really have no informed guess to make. Just off the top of my head, I might think a new smoke detector to replace the kind of broken Nest Protect, but the notion of a smoke detector with a screen just seems kind of ridiculous to me. It's also possible this is some specialized tool for a completely non-consumer arm of Google that the company is producing on its own for internal use only. Either way, it's speculation-worthy, and we'll be looking out for "CAP1" in the future. We've come into some information that suggests CAP1 is not the next version of Glass. Rather, it appears to be a smartwatch-esque health and activity tracker codenamed 'capicola' designed for use in conjunction with internal Google Life Sciences studies as part of the Android Study Kit app. It's possible this device will be used to improve Wear health features, but this is just conjecture. There is no reason to believe the hardware is the basis for any consumer product, and we highly doubt the device will ever be sold.